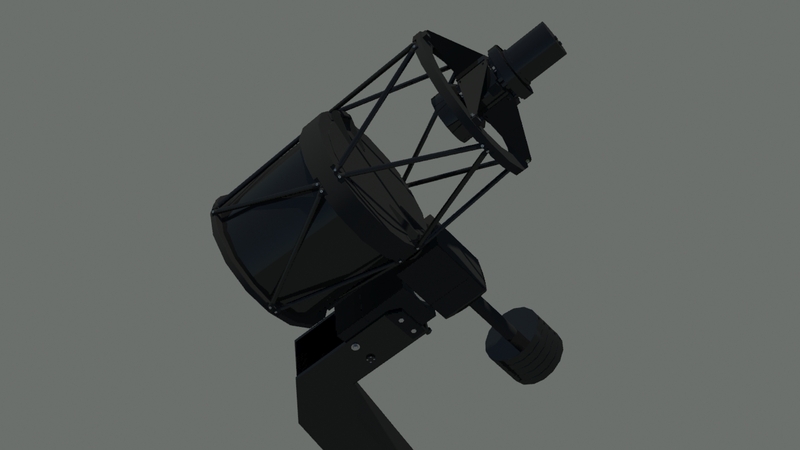 We have recently created a fully functional scale model of a TBT telescope, that can be controlled with your phone. Within ESA’s SSA and GSTP programmes the TBT project was born in 2012 to detect and keep track on NEOs. ESA (European Space Agency) is one of the biggest space agencies in the world, it’s a European intergovernmental organization dedicated to the exploration of the Solar System and the Universe beyond and to the launch and operation of different types of satellites. SSA (Space Situational Awareness) is ESA’s programme to guarantee our access to space by providing real-time accurate information about the space environment, specifical information regarding possible hazards to satellites and spacecraft. This hazards may be, among others, harmful space weather, satellites colliding between them or a NEO impact with a satellite. GSTP (General Support Technology Programme) is ESA’s programme to develop new space technologies that keep Europe at the forefront of technological innovation and allow us to design new devices and better instruments and components for future missions. TBT (Test-Bed Telescope) is a project within ESA’s SSA and GSTP programmes whose main objective is to look for NEOs and keep track on them. For that, it relies on a network of robotic telescopes designed and programmed to automatically do this task. NEOs (Near-Earth Objects) may refer to space debris and man-made satellites orbiting Earth or to Solar System small bodies such as comets, asteroids and meteoroids whose orbit crosses Earth’s orbit. In both cases, they are potential hazards to our satellites that orbit Earth unprotected. Space debris refers to broken or no-longer-used artificial satellites; empty fuel tanks, jettisoned fairings and other wastes produced by rockets; small metal pieces resulting from satellites crashes, or any other waste produced by humans that is currently in an Earth orbit (usually LEO and GEO). The telescopes network in which the TBT project relies to detect and keep track on NEOs has, at the present time, two observatories at ESA’s ESTRACK DS1 and DS2 ground tracking stations. Isdefe was the prime contractor for this project, and it chose APM Telescopes to supply the telescope, mount, and dome. ESTRACK (ESA’s tracking station network) is a network of ground stations built to communicate with ESA’s spacecrafts, providing a link between them and ESOC (the European Space Operations Centre). DS1 (Deep Space Antenna 1) is an ESTRACK tracking station located in New Norcia (Australia) (Lat: -31º 02’ 54” Lon: +116º 11’ 29”). Here a TBT telescope is located. DS2 (Deep Space Antenna 2) is another ESTRACK tracking station located in Cebreros (Ávila, Spain) (Lat: +40º 27’ 09” Lon: -04º 22’ 03”). Here a second TBT telescope is located. Isdefe (Systems Engineering for the Defense of Spain) is a public Spanish company with a long experience in space-technology that often works with ESA and NASA. During the day, the software will automatically create the STP (Short Term Plan), this is, each telescope’s observing plan for the following night. After sunset, the RTS-2 based system will open the dome unless the data from the weather station indicates otherwise. Then, the telescope should point itself to the coordinates set in the STP and while the mount is guided by the guiding camera the main camera will take pictures looking for NEOs. Those images must then be processed. The final processing software package chosen for this project is TOTAS, developed by Matthias Busch and currently used to process NEOs survey images taken at the OGS observatory. A text file with the coordinates and speed of the found objects is then generated and sent to ESOC (European Space Operations Centre) where the trajectory of the object will be calculated. If any of the found objects is an unknown NEO the whole network of telescopes is alerted to confirm its orbit and obtain any useful information about it. This process repeats itself every night, subsequently increasing the number of identified NEOs whose orbit is known. The project is still relatively new but the first tests have already provided promising results. In the test images above geostationary satellites (left), ExoMars (center) and asteroids (right) detection were successful. The observations will continue until fully automatic operations phase is reached. 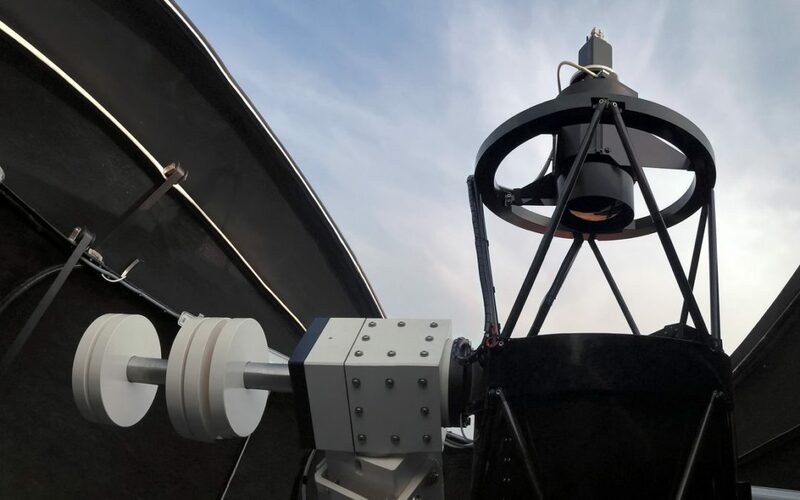 Moreover, a new TBT telescope supported by ESO (European Southern Observatory) and located in Chile is foreseen, and more observatories will come in the near future. The long-term objective of the TBT project is to build a big world robotic telescope network to automatically detect and keep track on every near-Earth object. 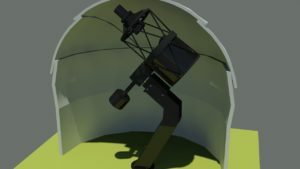 Back to us, besides other collaborations with the project that you may check in this and this articles, we have created a fully functional robotic scaled model of the TBT telescope. Our modelers designed the telescope from scratch but keeping the same shape and details of the original TBT telescope. Once the model is ready, we 3D-print it at 1:5 scale and wire it. The telescope motors are also included in this phase. The controllers and the user interface are then programmed and finally using an Arduino electronic card that is connected to the telescope and to the internet we control the whole system. The result of this project is a small demonstrator of the TBT telescope that despite its size has a high potential. It’s perfect for educational and science dissemination purposes as well as for business meetings. It can be controlled by a mobile app, so you can just place it at the center of the table and explain how it works. The user interface includes a complete demonstration mode, you can point the telescope to several coordinates, park it, and even send telemetry and data to a web server. You can also connect it to a weather station with rain sensor, humidity detectors and temperature and light sensor to show how it works. 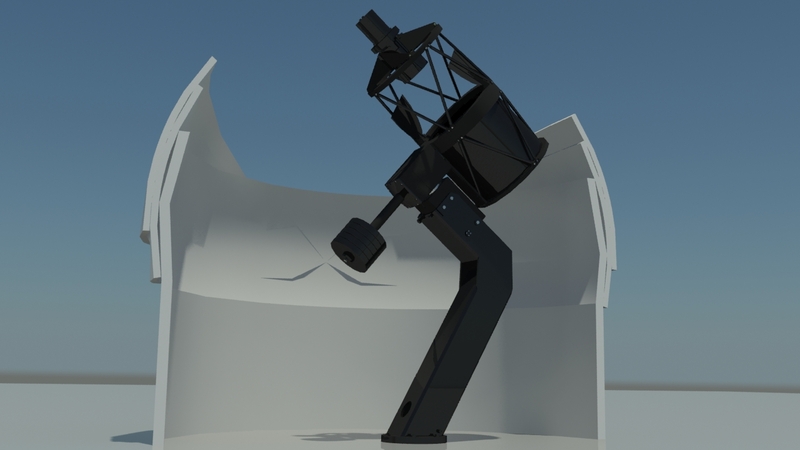 All in all, it’s a fully functional robotic scaled model TBT telescope available for anyone who wants to benefit from its potential.